For decades, the federal Clean Air Act has caused sulfur levels in electricity-generating gasoline and oil to fall dramatically. The results have been enormous. According to one study, the benefits of EPA regulations on sulfur (and nitrogen) have exceeded costs by 30 to 1. Most of these benefits have to do with public health. What a lot of people don’t realize is that sulfur in heating oil is now falling just as dramatically as a result of policies at the state level. As recently as 2013, Massachusetts, Rhode Island and most other states allowed heating oil to have 500 parts per million. A few years before that, 2000 parts per million was commonplace. 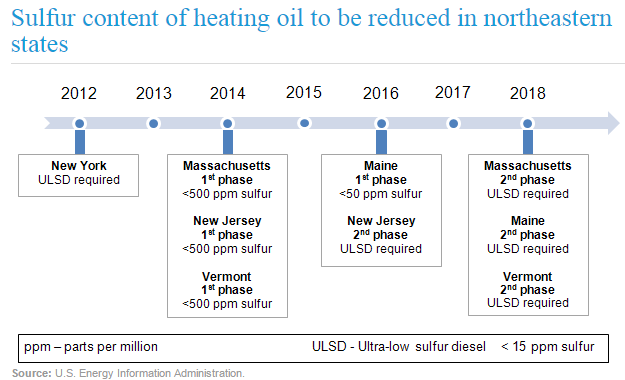 But in 2018, heating oil in Massachusetts and Rhode Island must be “Ultra Low Sulfur” (ULS) and have no more than 15 parts per million, just 3% of the 2013 regulation. This is excellent news for the environment, public health and for consumers. Think about that – sulfur is what causes soot and soot clogs up burner nozzles. Remove the sulfur and soot builds up MUCH slower. The ULS era has already begun for most of Mass Energy and People's Power & Light's oil dealers, since an increasing number of the wholesale locations stock only ULS heating oil. Some dealers have decided to deliver ULS exclusively, because they have to make fewer emergency calls with the cleaner burning low sulfur fuel. Think about that – sulfur is what causes soot and soot clogs up burner nozzles. Remove the sulfur and soot builds up MUCH slower. The advantages of ULS come at a modest cost, maybe a nickel more than oil with 500 ppm sulphur content. We think the payback of requiring less service and keeping your heater running efficiently longer makes that extra nickel worth it. In fact, ULS oil burns about 1% more efficiently than oil with 500 ppm. So you save 2-3 cents just on the fuel and even more on lower service costs. While ULS heating oil sounds pretty good, there is more to the story. Biodiesel contains no sulfur and is the greenest possible product one could burn. Use of biodiesel is more widespread than ever before, thanks to the federal government incentives to refiners and wholesalers to blend biodiesel into heating oil. One of our oil dealers, who tests many of the loads they buy, reports that there is always at least 5% biodiesel in the product they buy, regardless of whether or not it is specifically labelled as biodiesel. So, whatever oil dealer you sign up with, you stand a good chance of getting biodiesel for no additional cost. Again, dealers see advantages to providing you ULS with 5% biodiesel in order to save on the cost of servicing a clogged up burner. Dealers tend to lose money when they have to send our service technician at night or on weekends to clean out a heating system. For more information about biodiesel through our program, click here. As you will see, we’re supporting companies that make biodiesel from waste vegetable oil and animal fats. 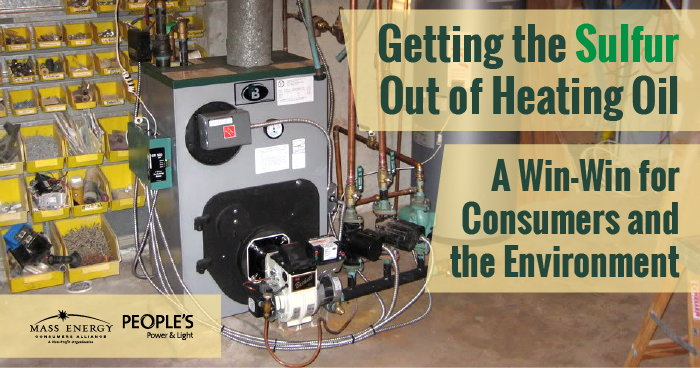 With anything that requires burning a fuel – a power plant, a car, or your heating system – efficiency and cleanliness (or dirtiness) is dependent upon several things. But, we know that oil with less sulfur is more efficient. And we know that it places less stress on the machine. Plus, it enables higher efficiency in equipment, so there’s a synergistic effect to the benefit of consumers and the environment. In Europe, ULS has been around for over a decade and because of that they have oil-fired heating systems that are 90%+ efficient, significantly higher than most of we’re seeing around here. So we can probably expect to see more systems like that here in the not too distant future. If your system needs to be replaced, ask your dealer for a high-efficiency, condensing system. In our view, ULS is a real example of smart government regulation in everyone’s interest. It should have been brought into Massachusetts and Rhode Island back in 2012 when New York State adopted it. But it’s here now. With cleaner oil, both consumers and oil dealers win. Now that you’ve read about the virtues of ULS and biodiesel, please remember that you can always make smart investments to reduce your consumption of fuel by weatherizing your home. If you live in Rhode Island, learn more here and schedule a free energy assessment. If you live in Massachusetts, check out MassSave.